A young star observed by the Spitzer Space Telescope appearsto be home to a wild ? and young ? planetary system that shares some of thefrenetic dynamics thought to have shaped the early years of our own solarsystem. The Spitzer observations suggest young planets circling thestar are disturbing smaller comet-like bodies, causing them to collide and kickup a huge halo ofdust. The star, called HR 8799, became one of the first of twostars with planets that were directly imaged from Earth in November 2008. Ground-basedtelescopes at the W.M. Keck Observatory and the Gemini Observatory, both inHawaii, took images of three planets orbiting in the far reaches of the system.Each of the three distant worlds is roughly 10 times the mass of Jupiter. 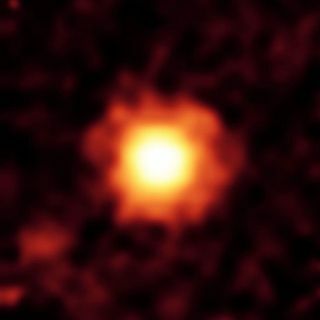 HR 8799 is younger and more massive than our sun, which ismore than 4.5 billion years old and more than 300,000 times the mass of Earth.It is about 129 light-years from Earth, so scientists weren't sure if Spitzerwould be able to snap a picture of its debris disk. But to their amazement, itsucceeded. The Spitzer team, led by Kate Su of the University of Arizona, Tucson, says the giant cloud of fine dust around the disk is veryunusual. The researchers say this dust must be coming from collisions amongsmall bodies similar to the comets or icy bodies that make up today's KuiperBelt objects in our solar system. "The system is very chaotic and collisions are sprayingup a huge cloud of fine dust," Su said. The gravity of the three large planets is throwing thesmaller bodies off course, causing them to migrate around and collide with eachother. Astronomers think the planets may have yet to reach their final stableorbits, so more violence could be in store. A similar setup has also been seen by Spitzer and the HubbleSpace Telescope around the star Fomalhaut, which sits about 25 light-years fromEarth. "What's exciting is that we have a direct link betweena planetary disk and imaged planets," Su said. "We've been studyingdisks for a long time, but thisstar and Fomalhaut are the only two examples of systems where we can studythe relationships between the locations of planets and the disks." When our solar system was young, astronomers think it wentthrough similar planet migrations. Jupiter and Saturn moved around quite a bit,throwing comets around, sometimes into Earth. Some say the most extreme part of this phase, called thelate heavy bombardment, explains how our planet got water. Wet, snowball-likecomets are thought to have crashed into Earth, delivering life's favoriteliquid. The Spitzer results are detailed in the Nov. 1 issue ofAstrophysical Journal.